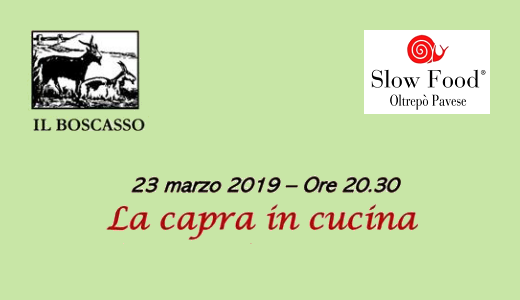 Join us in Ruino (PV) at Il Boscasso farm on Saturday, March 23rd 2019 for a special goat dinner. The courses of the menu will be paired with our wines and those of our friend Lodovica Lusenti from the nearby Colli Piacentini area. Andrea Picchioni and Lodovica Lusenti will present their wines. Special guests of the event will be Slow Food Oltrepò Pavese delegate Teresio Nardi and famous winemaker Mario Maffi. A sourdough bread produced with the local ancient grains flours produced by the Georgescu-Roegen association will be served during the dinner.